A jolly good game... fun and challenging to find, make and play... again and again. A 3 year old maybe able to play this game with two matching pairs and even help do the clues. 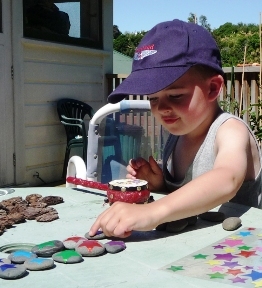 4 year olds need you to have the materials ready or at least the materials easy to collect quickly, then they can do the clues and play. Older kids really get into the spirit, both making and playing. 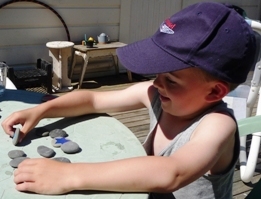 Small rocks are good; bark and bottle tops (but you don't throw bottle tops in your garden do you!). They should be at least 3cm diameter, so this might keep the kids occupied for quite a while. If you're at the beach, collect flattish or clam shaped shells instead and bring them home. 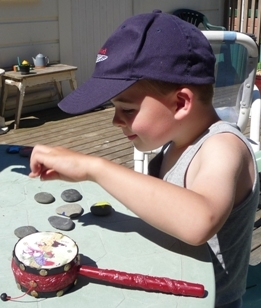 Now, using permanent marker pens, starting with number 1, write numbers on the bottom of the stones or shells. Write two of each number, that is: write 3 on the bottom of one stone and 3 on the bottom on another stone. Older kids can carefully do this. Alternatively buy stickers in pairs and stick those on. This is a good activity for little ones to do. Or they can carefully dab circles of colour using different coloured paints or pens. Older kids or you can also draw two smiley faces, two sad faces, two boys, two girls, two fish, two flowers... and so on. 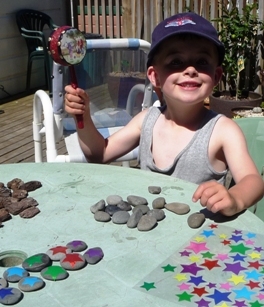 Arrange the pebbles or shells with the clues downwards, randomly scattered, or in rows to make it easier. Take it in turns to turn one over and find the matching pair. 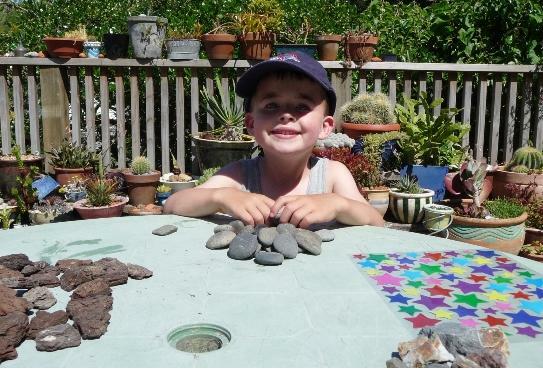 Put the stones down with the clue facing up as you turn them over so others can see and (hopefully) remember where they are. If you have a match — goody, now have another go. If you don't get a match, turn the stones back over again to hide the clue and the next player has a go. Use just a few with young ones, and increase the quantity as memories get smarter! Interestingly kids and adults are just about equal in this great game; some you win, some you lose — watch out. Here's 4-and-a-bit year old Max showing how clever he is. 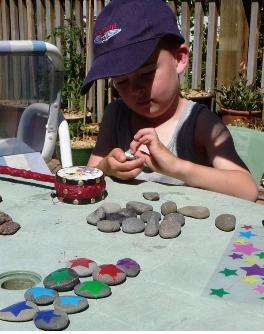 Here he is chosing which materials to use. Below: Max is putting on matching stars. He's keeping his drum handy to celebrate. Max is finished making the game and starts to excitedly play. 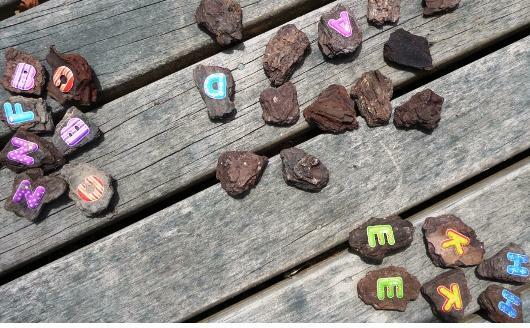 Here are the finished memory star stones and another game made with bits of bark and stick on letters.